Moscow has repeatedly called for a thorough investigation into chemical attacks in Syria, in particular, the April Khan Sheikhoun incident that killed at least 80 people. The US and its allies accused Damascus of the chemical attack, while the Syrian government insisted that it has no such weapons since 2014. Russia has vetoed the US-draft resolution to extend the mandate of the United Nations-Organization for the Protection of Chemical Weapons (UN-OPCW) Joint Investigative Mechanism that was tasked to probe cases of possible chemical weapons use in Syria. "The result of the voting is as follows: eleven votes in favor, two votes against, two abstentions. The draft resolution has not been not adopted owing to the negative vote of a permanent member of the [UN Security] Council," UN Security Council President and French Ambassador Francois Delattre said after the vote. The Russian envoy to the UN, Vasily Nebenzia has explained Moscow's decision to veto the resolution. "We didn’t shut down the JIM [Joint Investigative Mechanism], we just didn’t make a decision to extend its mandate today, but we will come back to this issue," Nebenzia has stated. Speaking to reporters after the UN Security Council meeting, Nebenzia said the meeting was "a show" and the fate of the JIM should be decided in due course and in due time and suggested discussing the report in a non-politicized atmosphere. "Russia has always been in favor of carrying out the work of the Joint Mechanism systematically and in planned order. The issue of a new JIM report is expected in the near future. We will study it most thoroughly, and after that propose further steps," the Russian Foreign Ministry has stated. The vote came a day after the Russian Foreign Ministry stated that it was necessary to study the OPCW-UN Joint Investigative Mechanism report which was expected to be delievered on October 26. However, the US insisted that the mandate should be extended immediately as it would expire on November 16. According to Moscow, Russia's position on the extension of the mandate would depend on the quality of the investigation and its compliance with the Chemical Weapons Convention. The OPCW-UN Joint Investigative Mechanism was tasked to probe chemical attacks in Syria, with the Khan Sheikhoun incident that took place in Syria's Idlib province on April 4, 2017, leaving 80 people dead and injuring 200 more, being one of the instances of the use of banned weapons in the war-torn state. The National Coalition for Syrian Revolutionary and Opposition Forces, supported by the United States, immediately blamed the Syrian government for using the chemical weapons against civilian population. 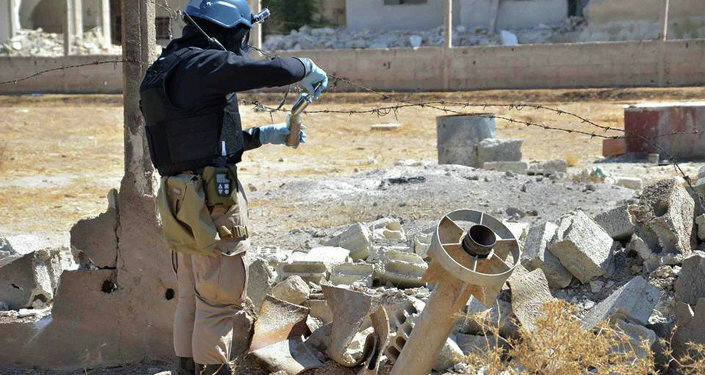 Damascus has refuted the allegations, pointing out that it does not possess any chemical weapons and that the full destruction of its arsenal was confirmed by the Organisation for the Prohibition of Chemical Weapons (OPCW). Commenting on the accusations against Damascus, Russia has multiple times reiterated its position that all chemical weapons were taken out of Syria in mid-2014 with Washington's assistance and called for a thorough probe into the Khan Sheikhoun events. In an April interview with Sputnik, Syrian President Bashar Assad said that there was no chemical weapon attack in Idlib, adding that the reports of it were a false flag and fabrication which was supposed to justify a US missile strike on the Syrian airbase. Despite Washington blaming the Syrian government for the Idlib chemical incident even before the probe into it was launched, most recently, the US has admitted that terrorists in the country are in possession of such weapons.